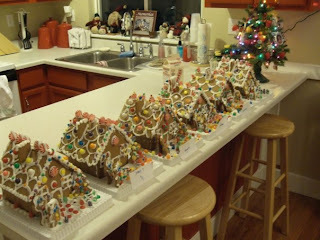 I have seen several people who's blogs I stalk, post pictures of their very cute gingerbread houses that their families have done. This has never been a tradition in my family, and I may have found out why today. Growing up with parents who are both artists, I have found a vast number of people who assume that talent was passed on to all their children. Sadly it was not, at least not to me. I am going to print out these photos and carry them in my wallet as prof.
Now this was a kit, and I'm pretty sure that is supposed to make it easier. Now granted the decorating was done by a 3 and 4 yr old, but the icing was done by an adult (you know who you are) and I'm a little worried. Notice the trees that had to be used as braces to keep the roof from sliding off. Now the kids had a lot of fun, which was the point, and the end result made it so that we didn't feel bad at all about eating the house. But I look at these pictures and it reminds me of going to the Christmas Chorus concerts when I was a kid. The concert is held in the chapel at the state mental hospital and when I was a kid there was a tree that had decorations made by the patients. I just remember always seeing candy cane reindeer that had 3 antlers and 5 eyes, things like that. Not that I'm saying my family is mentally handicapped, (although that is debatable), but I think we need some refining on our gingerbread house skills. Christmas has come and gone once again. I think this Christmas was probably a pretty typical toddler Christmas. Sheer elation along with complete meltdowns. I think my family got their first glimpse at just how loud Will can scream. For Christmas Eve we had our traditional Craig family Swedish dinner. The party was at my grandpa's house, and I first have to say how much I love this wallpaper in the bathroom. I'm normally not a fan of any wallpaper, but I'm not sure if you can get more awesome than this. There were lots of cousins for the kids to play with and the food was great as always. I had the assignment to attempt the rice pudding. After some suggestions from Britta, I think it turned out pretty good. Even if it was a little past it's prime by the time we got around to dessert. Maiken's water was salted by Katy, but I'm not sure if she drank any after the attack, so it may have gone unnoticed. Hey, if the prank is still going even though we are 30 yr olds, I don't see it stopping anytime soon. I attempted to get some pictures of the kids in front of the tree, it was an ordeal. This was the result of me asking them to stand next to each other. Fine, then we will try them apart. Christmas morning opening of presents. I took some videos of Will opening his presents, but I guess I had my camera turned sideways the whole time. So I need to figure out how to fix that. Will's big presents were a fire truck (thanks to special Santa who looks a lot like my boss), a fireman dress up and a food/cooking set. I was most excited about the fireman dress up because Will has been playing fireman a lot and using a rubber snake as his firehose. I specifically looked for a set with a fire hose and thought it would be a hit. I didn't think that he would throw a tantrum and shut himself in the bathroom because you can't put real water in the fire hose. A snake, that's fine to pretend with, but none of these fake hoses. The highlight of the morning was being able to talk to Britta, Tom and Ella on video phone. Ella was very excited to be on the camera and it made it a little easier to not have them here. The present unwrapping ended with another meltdown from Will. What do you mean there aren't anymore presents? And how dare Lucia want to touch my presents! Oven pancakes for breakfast and then home for a much needed break and nap. Back to mom and dad's for dinner. Stayed up late watching Wall-E. Decided I didn't want to brave the blizzard so we stayed over for one more night. This time I got to sleep in Alex's king size bed. Very comfy, and it's amazing that even though Will was sleeping in his usual horizontal position, I had more than 2 ft to spread out in. Overall a good Christmas. I'm glad Keeley, Will and Alex were all able to come up, but still wished the whole fam could have been there. I missed seeing the Van Wagner clan, Will and I will have to come in the next week to see everyone. Hope everyone had a good Christmas, on to the next adventure. Here is Will singing Hush Little Baby to me. I think he only remembers one line, and it's the one line he has always been most interested in. So I think my new year's resolution is going to be more honest with myself. I'm going to try to not hide behind my fear that others won't like me if I say or do something that they don't agree with. I don't like having to pretend that I don't feel a certain way about something, or that my opinion has any less value. So with that, here it goes. I know that many people that will read this don't agree with me on this issue, but these are my feelings. I purposely haven't delved into politics on my blog or brought up certain issues, but this is one that I just feel too strongly about to not mention. I can't tell you how hurt I was that Proposition 8 passed this last election. Not mad or angry, but hurt for what I think it says about our society. I came across this video and it really touched me because he brings up a lot of points that I happen to believe in very strongly. So I will leave the rest to him. They have another song, More Love that I think hits on a lot of the same points. I know a lot of people would say this is naive, but I whole heartedly feel that we would have a lot less problems if everyone just had more love towards other people. The golden rule really is a great rule. I don't think very many people really live by it. I'll admit it's hard to do, it requires not always putting yourself above others. It requires being able to give up something of yourself for the good of someone else. And isn't that what love really is about? Not giving up who you are, but being able to sacrifice something because of the greater benefit it will be to someone else. I'll admit I haven't been in the "Christmas Spirit" this year. But I do hope for better times. So anyone who knows me very well probably knows I have some issues with shoes. My sister Britta has the typical girl shoe fetish which I am lacking. Of course it helps that she has size 5 feet and so anything looks cute on her. I on the other hand have feet that nothing fits. Some of my worst memories as a kid involve trying to find shoes. It was never a one store or even one day process. I have wide feet but narrow heals, which they don't design shoes for. Plus I think I have claustrophobic toes, they don't like to be confined. This translates to other areas including the fact that I can't sleep in a sleeping bag if it is zipped up. My feet are also my thermostat and I need to be able to wiggle them out if I'm too hot and then pull them back in when my ideal temperature has been reached. Enter my fondness for flip flops. In high school it started with my Kmart Birkenstock knockoffs. I'm pretty sure I wore them 98% of the time, even in the winter. And socks and any kind of sandals don't go together, just so you know. This did lead to some interesting experiences such as being at a dance at Springville High School and my friends and I all wanting to go home early. Of course this was before the days of cell phones and I don't remember if there wasn't a pay phone around, or if we just didn't have any money, but it was decided that we should walk up the hill behind the school to where my grandparents lived and call my dad to come pick us up early. For some reason we decided that it would be much quicker to walk across the football field even though there were a couple of inches of snow on it. And of course I was wearing my Birknocks, but trudging away we went. I have matured since high school and now break out my one pair of closed toe shoes when there is fresh snow on the ground, but that is the only time I venture from the flip flops. I do have a few theories about sticking with the flip flops, besides the comfort of them. When it's raining flip flops are by far the best thing to be wearing, unless you want to wear rubber boots all day. Yes your feet get wet, but they dry much faster than shoes would. So you don't have to spend the rest of the day with wet shoes and socks. Same goes for it being cold outside. I feel like my shoes get cold and take a really long time to warm up, meaning my feet stay cold. Unlike wearing flip flops were my feet are cold if I’m outside for an extended period of time, but warm up very fast once going inside. Of course both of these points could have something to do with the fact that the one pair of shoes I own have several holes and cracks in them. I've been looking, trust me, but I just can't find a suitable replacement for the Super Girl shoes. It seems that Will has followed in my fondness for being shoeless. I'm lucky if we get to the store before he has taken his shoes off in the car. And the first thing he does when we get home is take off his shoes. Of course he follows that immediately with his pants, which did not come from me. When my sisters and I were growing up we used to run around outside on the road to toughen up our feet at the beginning of the summer so we didn't have to wear shoes outside. Of course the down side to only wearing flip flops is that my feet are definitely not touchable soft, and usually look like I have been walking around without shoes on. So I finally had to break out the Super Girls this week because of the snow, another reason I hate snow. On Tuesday I was dropping off Will at Pat's apartment. As we were walking up the steps he looked down at my feet and said, "Mommy, whose shoes are those? Are you wearing aunt Alex's shoes?" I guess he has noticed my preference too. On Wednesday my quirk also made an appearance at the work Christmas Party Jeopardy game. Sadly, because of the snow I was not holding very true to the statement and was not wearing my flip flops even though it was winter. It’s probably the one thing I get the most comments on, even from strangers. I don’t foresee this changing anytime soon, so here’s looking forward to more flip flop wearable days. Megan and Scott put up a Cuteness Throwdown on their blog. Now being the kind of person who wishes that everything could end in a tie, I'm just going to post some pictures that I think are pretty damn cute. And after the Art City Days Baby Contest experience, I swore I would never enter Will in an official contest again. And Scott is very talented, so I consider this official. Unfortunately all of our videos of Will are still stuck on the tapes they were recorded on, and I don't really know how to get them on the computer. Maybe someday. For now, just some random cuteness. I will mention though that Target thought this last picture was cute enough to be added to their display book. He ended up having the pictures from his Easter photo shoot added to the book too. After that it's gone down hill. Toddlers who won't sit still for photo's usually don't get added to the book. I just got back from Walmart. While loading my stuff into my car a girl who looked to be in her early 20's came over and said that she had to drive down here from American Fork to pick up a prescription, and now was out of gas. She said she needed $12 to get home. For some reason I think I am the perfect target for people on this kind of thing. I have yet to go a year where at Christmas time someone approaches me in a parking lot and gives me the same kind of story. The problem I have is that for some reason I lack the ability to lie to someone face to face. Sometimes I think that is a good thing, but in cases like this I feel that it leaves me vulnerable. I rarely carry cash and so I always say I'll check but I'm not sure if I have anything, always hoping that I will open my wallet and see it empty. For some reason, they always catch me on the rare occasion that I do have cash. So when I opened my wallet today and saw a $10 bill I gave it to her. She did ask for my phone number so that she could try and pay me back, but if it is a scam the last thing I want her to have is my phone number. So I just told her Merry Christmas. The problem is that as soon as I got in my car, that is when I start replaying it in my mind. $12 to get back to American Fork? Pretty sure you could get there on $2 in gas. I then noticed that the first thing she did was go back to her truck and call someone. She didn't really seemed stressed or bothered the way I would be if I was in that situation. And she didn't seem in any hurry to leave. I drove away slowly watching her and I had the feeling she was waiting for me to leave and then was going to go ask someone else the same thing. Two years ago I had the same type of situation in Provo. I actually really did believe the guy until I saw him approach someone else even after I have given him more than enough money to get where he said he was going. I watched several episodes of Intervention where drug addicts have used the same type of story on people to get drug money. So maybe now I'm just jaded. Although not enough that I feel I can say no to someone in person. So do I feel jipped that they talked me out of $10 or do I just figure that no matter what the reason was, they needed the money more than I do.